I have decided to sculpt a mini portrait bust in addition to a full -sized portrait bust of Fannie Mae Duncan. It will be of similar size and style as my “Eleanor” - which has been very popular with collectors due to it’s small size and intimacy. Clay will not support itself so I must start by building an armature that will act as the skeleton and will hold the clay in place while I work on the sculpture. I will be using a wood base and several different sizes of aluminum wire to build the armature. As this is a small bust it only needs to be simple to be effective. 1)To begin the sculpture I first prepare a wooden board by sanding it smooth and giving it several coats of a polyurethane. Once dry I find the center of the board and determine the size of aluminum wire that I’ll be using so I know how big to drill the hole. 3) Then I drill down the proper depth. 4) I design the armature and draw it on paper to scale, then use pliers and wire cutters to cut the aluminum wire. 6)Using electrical tape, I tape the top of the two light-bulb shaped wires together and the using a smaller gauge aluminum wire I wrap the bottom of the two wires securely and leave out two ends that will help support the clay in the shoulder area. The bottom wire will insert into the hole that I had drilled and will now be the armature to support the oil-based clay. 8) Aluminum is flexible and I use my pliers to bend the armature until I achieve the desired size, shape and tilt. 9) Oil-based clay is warmed up and added to the armature. With the armature made, I can now begin blocking in the forms of the skull to begin the portrait. For this work I am using J-mac Classic Clay in Hard - it is an oil based clay that doesn’t dry out or harden. 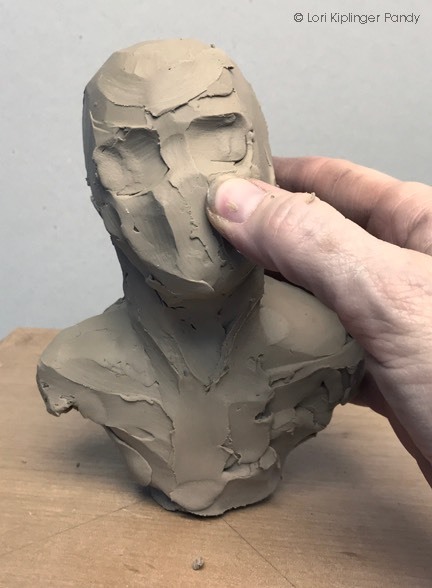 To make a permanent sculpture using oil-based clay a mold will need to be made so that a more permanent medium such as plaster, cast stone or wax for casting in bronze will need to be made.